1st Day: ALGHERO – RIVIERA DEL CORALLO - Arrival in Alghero, pick up of the car and transfer to the city. The morning can be dedicated to visit the precious old town of this beautiful city. In the afternoon you will reach the Necropolis “Anghelu Ruju” (3500-1800 b.C. ), made up of 38 tombs carved out of a sandstone and limestone bed of rock. The decoration in the tombs is evidence of their sacred value. The trip continues with the visit of the Nuraghe Palmavera, a monumental site with a central block consisting of 2 towers. Overnight in Hotel. 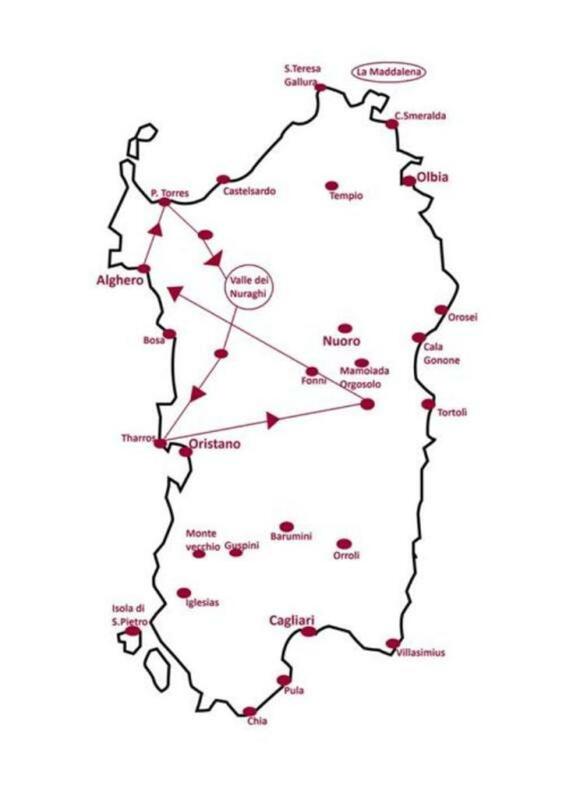 2nd Day: PORTO TORRES – SASSARI – SANTU ANTINE – S.ANDREA PRIU - You will be heading towards Porto Torres where we suggest to visit the Basilica of S. Gavino, the big Roman bridge, and the museum of the city that preserves the archeological finds. Driving southbound, not far from the city, you will find the important pre-historical altar similar to a Ziqqurat “Monte d’Accoddi”. Continuing to Sassari, you can visit the “SANNA MUSEUM”. In the afternoon you will visit an important example of the nuragic civilization, the Nuragic site of Santu Antine, probably dating back at XVI century b.C.. The visit continues with the important “Domus de Janas” (for some, houses of the fairies) of S. Andrea Priu, in the surroundings of Bonorva. Overnight stay in Santu Lussurgiu or in other hotel in this area. 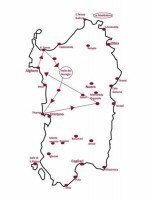 3rd Day: ORISTANO – THARROS - Departure to Oristano, testimony of an important period of Sardinia’s history, the Giudicato di Arborea. Lots of finds of this period can be seen at the Museum “Antiquarium Arborense”. The journey follows driving to the peninsula of the Sinis to visit the small church of San Salvatore di Sinis, dated back to the IV century a.C. The near Phoenician city of Tharros is one of the most important sites on the island. Its finds are exhibited in different archeological museums, Turin, Cagliari, Oristano and in the British Museum. Back to Hotel for the overnight stay. 4th Day: SANTA CRISTINA – ROMAN TERMAE - Before arriving to the sanctuary of Nuragic civilization in Santa Cristina, you can have a quick stop to visit the Nuraghe Losa. Once arrived in Santa Cristina, in the municipal district of Paulilatino, you can admire the important Well Temple ascribable to the final Bronze Age (XI century b.C). Following the trip you will visit the Roman baths in the village of Fordongianus, wanted by the Emperor Traiano. The rectangular pool still collects the hot water maintaining a temperature of 54°C. Overnight stay in Fonni or in other hotel in this area. 5th Day: TISCALI - The day begins with a fascinating light trekking to the famous archeological village of Tiscali, built in a karst dolina missing the vault, in extraordinary control position over the valley. Inside the huge cave you can see finds of huts dating IX and VIII century b.C. Back to Hotel for the overnight stay. Notes: We suggest to find an expert local guide for doing this excursion because it’s easy to get lost. It’s not suggested to people who have deambulation problems. 6th Day: ALGHERO - Time at your disposal for relax or other individual activities. During the day, drive back to Alghero. The car is to be handed over to the car rental once back in airport, where our services end.